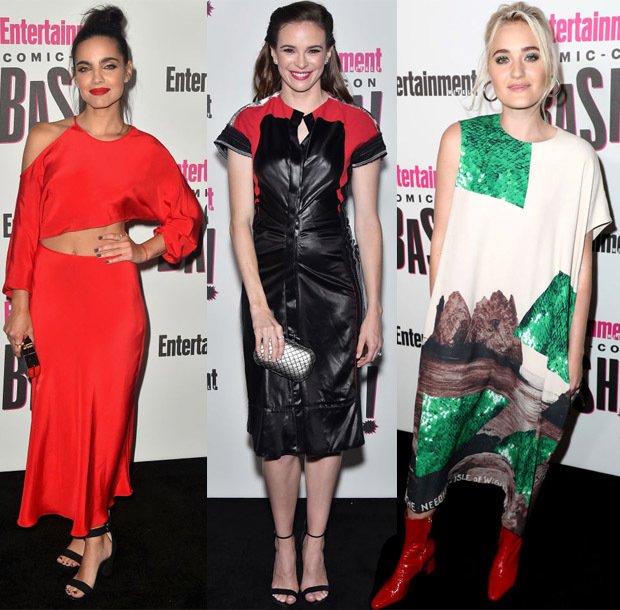 After spending hours promoting their film and TV shows, celebs let their hair down at Entertainment Weekly’s Comic-Con Bash on Saturday (July 21) in San Diego, California. Madelaine Petsch: I much prefer this dainty Monique Lhuillier Fall 2018 dress styled with ruby René Caovilla red pumps over the edgy look she tried to sell me during the day events. Summery and feminine; this feels more suited to her style. Cole Sprouse: If you’re thinking that the actor was bold to pair this Bottega Veneta Fall 2018 red blazer and printed shirt. You’ll be interested to know that he could’ve gone further with the runway yellow trousers. But black works perfectly for a more refined look. Lili Reinhart: The actress was oozing sensual elegance in her Ralph Lauren Pre-Fall 2018 Collection peony silk satin slip dress. Jamie Chung: As expected the actress outshone everyone in terms of originality in her blue Nadya Dzyak Fall 2018 dress. Even with all the detail, she didn’t let her accessories fade into the background, as she carried a rainbow hued Sensi Studio beaded bucket bag. Skyler Samuels: I love the ’80s power dressing vibe I’m getting from Skyler’s Alice McCall ‘ That’s All Coat’ mini tuxedo jacket dress from the Fall 2018 collection. Ginnifer Goodwin: While I love Ginnifer’s Markarian silver iridescent silver sequinned, bow accented dress from the Resort 2019, I’m not entirely sure that it’s working for her. The biggest let down is the hair styling. Chloe Bennet: The actress opted to go pretty in pink again in Ulla Johnson Fall 2018. While I see this hanging in Paris Hilton’s wardrobe, I love how Chloe is working this flirty style. 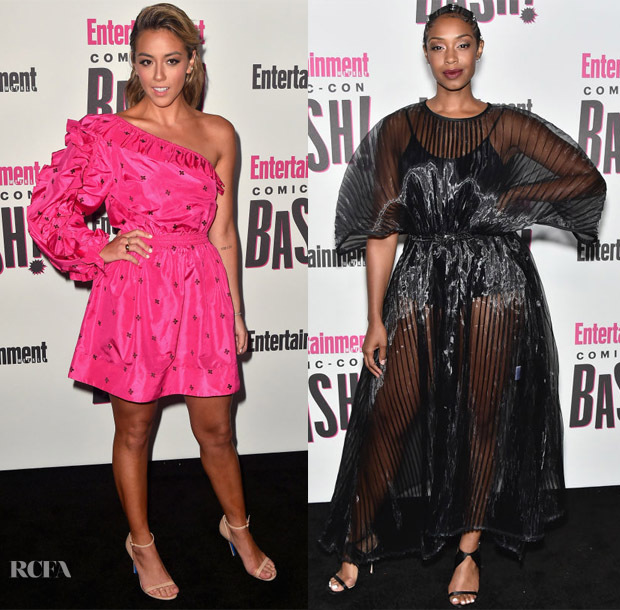 Chantel Riley: Along with Jamie Chung, Chantel was also serving up a futuristic look in this Sid Neigum Spring 2018 dress, which I feel you shouldn’t discount just because its sheer. Anya Taylor-Joy: Every now and then Anya will go edgy. On this occasion she lost me with the studded shorts of her Dolce & Gabbana look. Kat Graham: Between the graphics and the ruffles, I was in love with Kat’s Ermanno Scervino masterpiece. Danai Gurira: There is so much sparkle in Danai’s Michael Kors Collection Fall 2018 dress styled with Roger Vivier ‘Feather Swirl’ sandals that I’m thinking that maybe black will become her new signature look. Maria Gabriela de Faria: The actress was smoldering in her red Kalmanovich cut-out dress. Danielle Panabaker: I like the biker inspired vibe of this Carven Fall 2018 dress, but it feels like it was made for someone with a bit of attitude, and not for someone as sweet as Danielle. AJ Michalka: This A Detacher Fall 2018 dress was one of my favourites of this event, mostly because of the cool, effortless vibe, but also because of how the red booties add yet more spice.